The Art Deco District of Miami Beach is home to the world's second largest collection of Art Deco buildings. The distinctive style was the rage in the 1920s and 1930s. Many of the best Art Deco hotels can be found along Ocean Drive in South Beach between 6th and 9th streets. 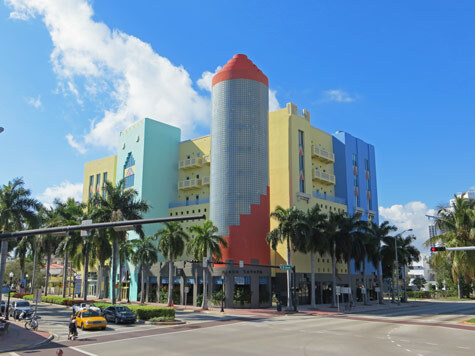 The building in this photograph is located at the corner or Washington Avenue and 5 Street in Miami Beach. The bounds of the Art Deco District is the Atlantic Ocean on the East, Lenox Court on the West, 6th Street on the South and Dade Boulevard on the North.